BOTOX® Cosmetic is a simple, non surgical, physician-administered treatment that can temporarily smooth moderate to severe frown lines between the brows in people from 18 to 65 years of age. It is the only treatment of its type approved by the Food and Drug Administration (FDA). 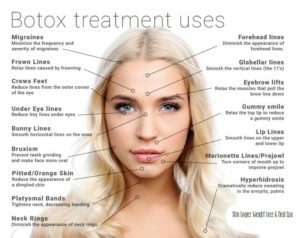 BOTOX® Cosmetic is derived from botulinum toxin type A, which provides a quick and effective remedy for the facial lines & wrinkles that age, stress, worry and environmental factors can produce. Botox injections smoothes frown lines on the forehead, between the eyes, and at the base of the nose. One 10-minute treatment—a few tiny injections—and within days there’s a noticeable improvement in moderate to severe frown lines between the brows, which can last up to 4 months. Results may vary.